Ugh. In investigating this quote, kindly passed on to me by one of my meditation students, I delved into an entire subculture devoted to saccharine quotes and trite parables, often rife with typos, poor grammar, and the kinds of abbreviations teenagers use in text messages. What is the difference between “I like you” [and] “I love you”? Beautifully answered by Buddha. 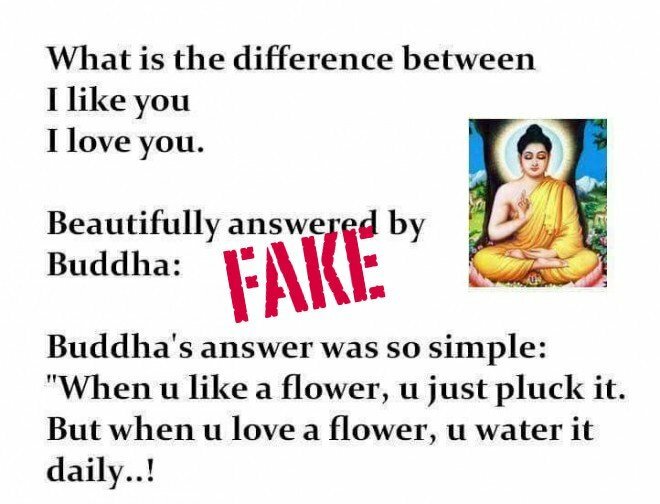 Buddha’s answer was so simple. When you like a flower, you just pluck it. But when you love a flower, you water it daily. When you like a flower, you just pluck it. But when you love a flower , you water it daily…..One who understand this, understand life…. The quote itself only seems to go back to 2013 or so. Google’s not very good at helping us search by date, unfortunately. I’m grateful to this quotation, however fake it is. The Buddha talked about “affection” as something to be avoided. The term he used is “pema.” Metta, however, which is love, lovingkindness, or just plain kindness, is to be encouraged. I wrote about this in the context of another (genuine) quotation. The reason for my gratitude is that I’d never really thought of pema in terms of “liking.” It’s not quite right as a translation, but I think that the difference between liking and loving does point to something that lies in the distinction between pema and metta. At the very least the contrast provides a useful analogy. The source of our fake quote? I’ve no idea. Presumably it started as a nice little message to be passed around on the web, and then some bright spark thought it would be a good idea to add the Buddha’s name. I don’t know the origin of this quote. It’s certainly not the Buddha, and the modern phrasing sounds more like Sharon Salzberg or Jack Kornfield. I even wondered if it might be something I’d written. Therefore, bhikkhus, you should train yourselves thus: ‘We will develop and cultivate the liberation of mind by lovingkindness, make it our vehicle, make it our basis, stabilize it, exercise ourselves in it, and fully perfect it.’ Thus should you train yourselves. Pursue this awareness with your might. As a writer, I have to say that “Kindness should be the natural way of life, not the exception” strikes me as being a poorly constructed sentence. “Natural way of life” is being contrasted with “exception” which I don’t think really works, since these expressions are not of the same kind. “Kindness should be the rule rather than the exception” would work.